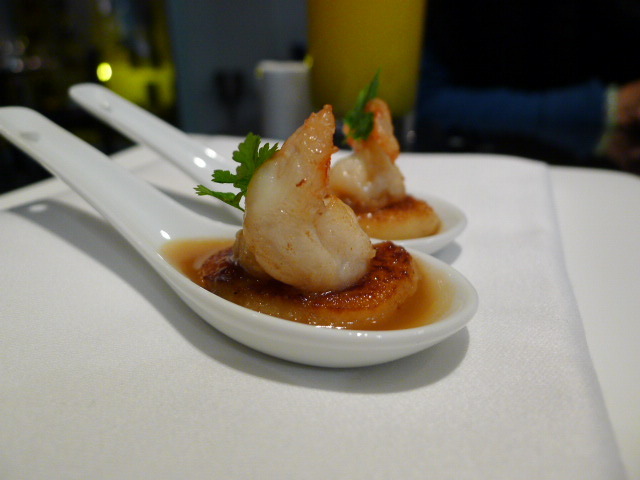 A second amuse of potato gnocchi with prawn and chicken stock was very pleasant. The seasoning in the stock was a touch heavy, but otherwise the prawn was sweet and the gnocchi light and fluffy. To starters, pan-fried king black prawns were lovely and sweet, although I would have liked a greater charred effect on the prawns for more flavour. 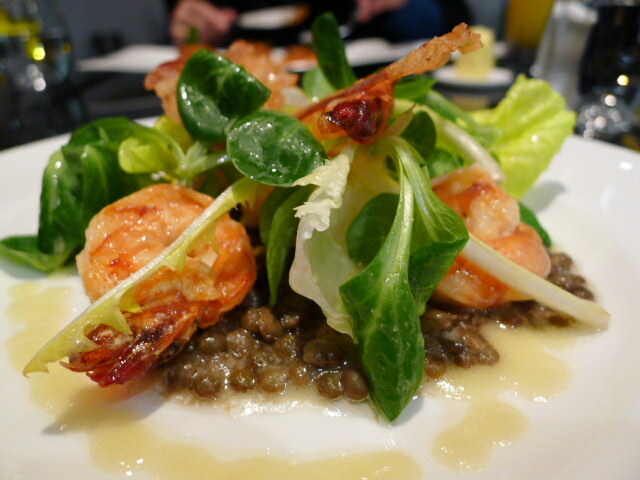 It came with crispy bacon and puy lentil vinaigrette. The lentils were well cooked, tender and worked well with the flavour of the bacon, although the use of cos and lamb’s lettuce in the dish made it feel quite summery rather than wintry. Seared Devon scallops were nicely cooked and well seasoned. The deep fried sage was crispy and provided a nice textural contrast to the sweetness of the scallop and the creaminess of the pumpkin purée. 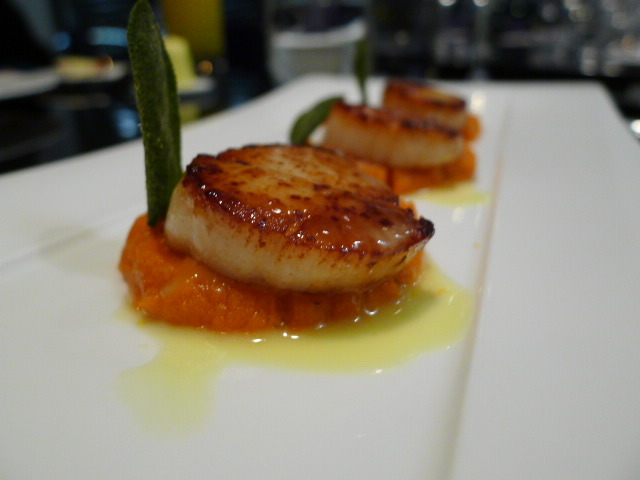 However, there was slightly too much purée relative to the size of the scallops. A palate cleanser of lemon yoghurt and gin sorbet was yoghurt-y and creamy, although it tasted very alcoholic as you got towards the bottom of the glass. 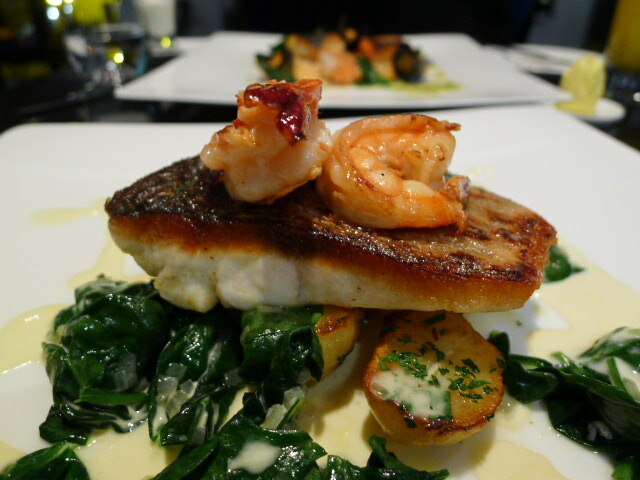 To mains, and I loved the crispiness of the skin on a dish of pan-seared wild sea bass with sauteed potatoes, baby spinach, black prawns and creamy fish sauce. The potatoes were nice and buttery, but a smidgen under done. Unlike the other prawns that we had eaten, one of the prawns in this dish was a bit mushy. The sauce, creamy, light and nicely reduced, demonstrated very good technique. 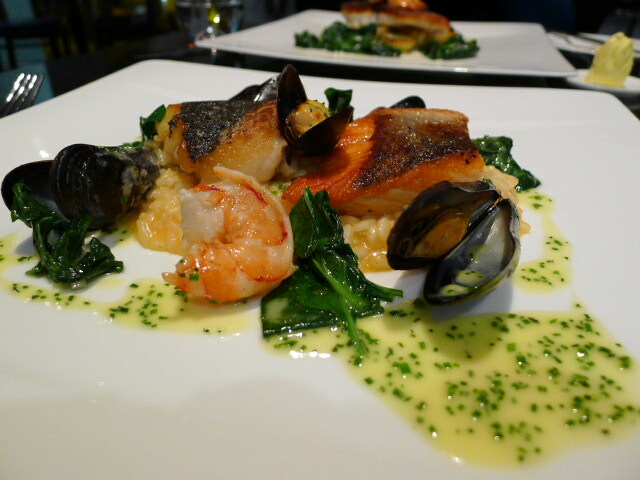 Pot au feu of seafood came with a mussel risotto, pan-fried sea bass, pan-fried Scottish salmon, a black tiger prawn and chive beurre blanc sauce. The fish skins were wonderfully crispy, although the salmon was overcooked and dry. Otherwise all the other components of the dish were nicely cooked, including a risotto which had a nice bite to it. This was a hearty and satisfying dish. 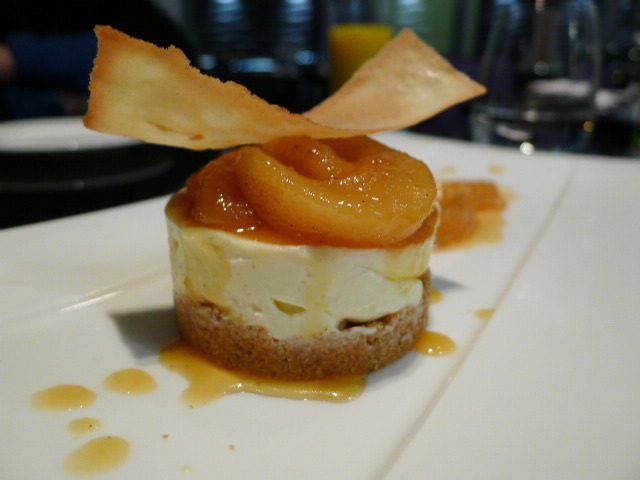 A dessert of caramelised pear cheesecake came with well caramelised pears which were tender and sweet. The cheesecake itself could have been sweeter as it was a little sour, and the vanilla tuille was very bland. 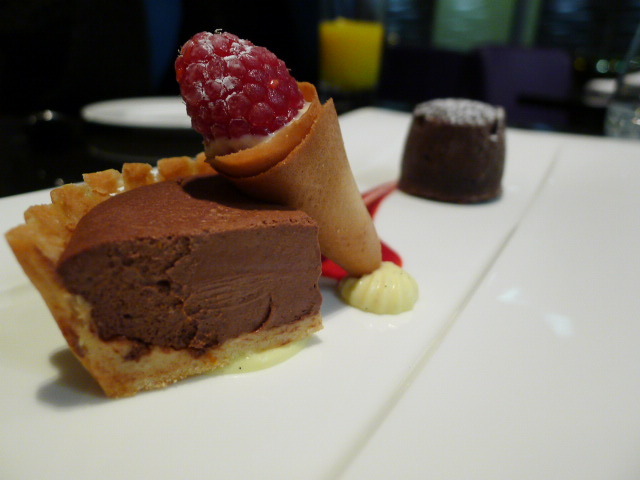 An orange and chocolate tart with chocolate fondant and blackberry coulis was all texture and no flavour. Other than a hint of orange, it didn’t really taste of anything. I couldn’t help but feel that the chef had skimped on the ingredients in this dessert. This was a disappointing pudding. 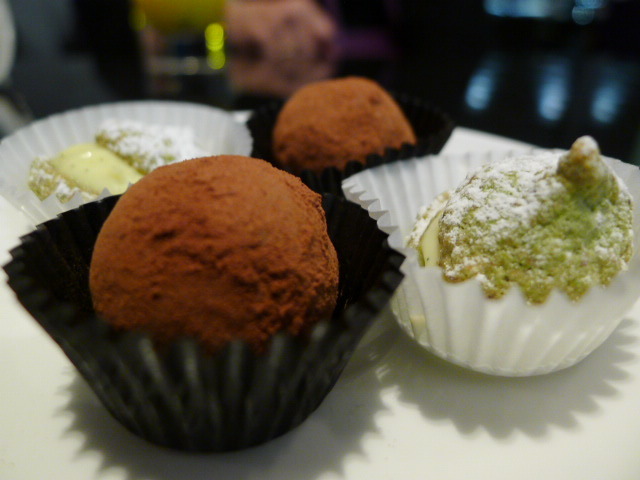 Petit fours included a mini pistachio macaroon which was hard rather than soft and gooey in the centre, and a chocolate truffle which had a nice texture but was a bit bland. I wasn’t enamoured with the desserts, but the seafood dishes were rather good and showed sound technique. Overall, the food was robust, hearty and comforting, and at £37.50 for two courses, it was reasonably priced (£45 for three courses, although I wouldn’t bother getting dessert). 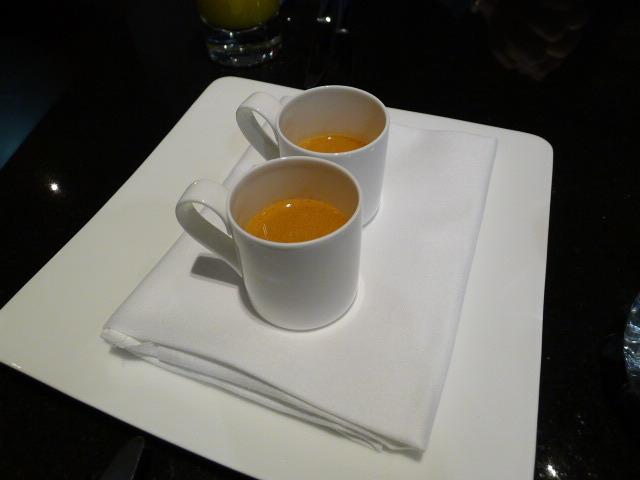 But despite the reasonably good food, sitting through a meal with no ambience was just a wee bit dull. You need other guests for a bit of vibe. Perhaps on another night it might have been busier. The service was reasonable. One of the waiters was really friendly and chatty, although another was a bit awkward. I don’t understand why The Fish Place picked the location that it did. I imagine dining al fresco style overlooking the Thames during the summer is going to be really nice. But we still have to get through the winter. If the restaurant doesn’t pick up soon, the only concern might be that it may feel the squeeze on its margins and start cutting costs, which would not a good thing where food is involved. Prices: £37.50 for two courses and £45 for three courses. Excludes drinks and service. Nice review of The Fish Place! After reading your review, I’m thinking you could actually win an award for it. Yes, seriously ^_~ . There’s a new award for the best reviews online being presented by Lunch.com (a site where people can share reviews on any topic). Lunch is recognizing the best reviews across a plethora of topics, and your restaurant reviews are fantastic — I think you stand a great shot of getting nominated and winning a “Golden Thumb” trophy! I work for Lunch, searching for the best reviews and reviewers online, so when I came across yours, it was a great fit. All the info about nominations and voting are on the Lunch Awards page (lunch.com/t/9), and any review written in 2010 is eligible (no matter where it was originally posted). If you know anybody else who is sharing amazing reviews online, they are welcome to post them on Lunch to be submitted as well. There are categories for best reviews of businesses, movies, books, products, hotels, video games – you name it! Really hope you submit your reviews for this year’s Lunch Awards! Plus, the “Golden Thumb” trophy is being produced by the same company who makes the Academy Oscar Awards! When you come on the site, follow me at lunch.com/zephyr2050 so I can be sure to also nominate your review.